JURGEN KLOPP HAS confirmed Virgil van Dijk is a doubt for Liverpool’s Premier League game at home to Leicester City. Van Dijk has started all 23 league games for the Reds this season, winning December’s Premier League player of the month award, but illness could rule him out of Wednesday’s visit of the Foxes. Former Southampton and Celtic centre-back Van Dijk has played a key role in Liverpool’s stunning campaign, with Klopp’s side four points clear of last term’s champions Manchester City. But Liverpool could be without the Netherlands international for the first time this season as he is struggling to recover from a virus. Liverpool have major problems in defence for the Leicester game with Joe Gomez still recovering from a fractured leg, while Trent Alexander-Arnold has a knee injury. James Milner filled in at right-back in Liverpool’s last Premier League game, a 4-3 win over Crystal Palace at Anfield, but he is suspended as he was sent off late in that game, with another makeshift option – Fabinho – another injury doubt. However, Dejan Lovren could come in for Van Dijk in the heart of Liverpool’s defence as the Croatia defender has been passed fit following a hamstring injury. “Virgil was a little bit ill but trained yesterday [Monday] — we will see,” Klopp said told reporters. With Liverpool having been knocked out of the FA Cup, Klopp took advantage of a rare break in his side’s schedule to take his squad to Dubai for a warm-weather break. “It was good we could do that and usually you’d say no games in that time, usually one game in that time would be good, difficult lineup-wise as we needed couple days for the boys and a few players were not a part of training until a few days ago,” he added. “But it was good, we didn’t have to play important cup competitions but it would not have been possible for a lot of players. We had a few more days and now have to show [it made a difference]. But Leicester are in the same situation so it’s not a massive advantage. Email “Reds defender Van Dijk emerges as a doubt through illness ”. 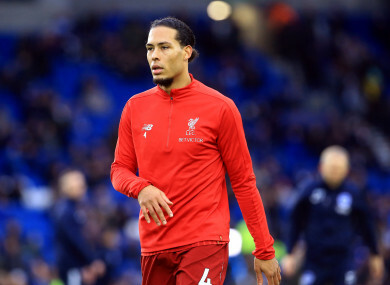 Feedback on “Reds defender Van Dijk emerges as a doubt through illness ”.